Initial details about the Peugeot 508 was announced in July but today Peugeot released more details and images for 508. The Peugeot 508 will be available in two body styles: sedan and station wagon (SW) and will be offered with several options of petrol and diesel engines featuring the Peugeot's new-generation e-HDi and HYbrid4 technologies. The all-new 508 will be manufactured in France for the European market and then in China for the Chinese market. Quality, purity, efficiency... the Peugeot 508 embodies the Marque's new expression in the segment of grand touring cars. its unique driveability, based on the Marque's longstanding expertise. With the 508, Peugeot continues its international offensive: It will be produced in France for the European market, then in China for the world's largest developing car market. Available in two body styles, Saloon and SW, the Peugeot 508 will be marketed in Europe from the beginning of 2011. With the 508, Peugeot reaffirms its presence and its ambitions in one of its traditional strong suits, the grand touring car segment. Over a period of several decades, every model in the "40X" and "50X" range has left an indelible imprint on its time: dueto a unique blend of style, road holding, versatility and robustness. The Peugeot 508 is a modern, forward-looking vehicle, perfectly attuned to the aspirations of customers who have moved with the times: demanding, dynamic and responsible. It comprises of two complementary body styles: a Saloon (with a length of 4.79 m) and an SW (4.81 m). Quality, purity and efficiency are the bywords that guided every aspect of the car's design, offering a multifaceted appeal to its owners with emotion as its central theme. Guided by the search for perfectly balanced and streamlined contours, the style of the 508 suggests a vehicle "sculpted from a solid", reflecting aspirations of elegance, robustness and build quality. At the front, the Peugeot 508 illustrates the development of the Marque's latest stylistic codes first unveiled on the SR1 concept car, with a single grille rendered in a "floating" style and piercing headlamps with a particularly marked visual expression, like its "LED tubes" visible both by day and by night. Similarly, at the rear, three red "claws" mask three rows of LEDs on the Saloon. The Peugeot 508 SW for its part has a more composite feel, with a red band that lights up when the rear lights are activated. The simple and elegant style of the fascia, the materials used, the meticulous finish, the durability and the technologies deployed (colour "head-up display", four-zone air conditioning, "hands-free" access and start-up) add to the exclusive ambience of the passenger compartment. Each passenger enjoys a privileged status thanks in particular to the car's excellent proportions. On the Peugeot 508 SW this in-car satisfaction is enhanced by the large panoramic glass roof. The boot too, is practical and accommodating, with a generous volume of 545 litres of liquid (515 dm3 according to the VDA standard) for the Saloon and 660 litres of liquid (560 dm3 VDA) for the SW. With the seat backs folded (they fold in one easy movement) to form a flat floor, this volume rises to 1,581 litres of liquid (1,381 dm3 VDA) for the Saloon and 1,865 litres (1,598 dm3 VDA) for the SW.
Environmental efficiency was a pivotal concern from the very start of the project with, initially, optimisation of the car's aerodynamics (a Cx starting from 0.25 and a SCx of 0.58!) and a weight reduction compared to the 407 (despite the increase in size and specifications). Under the bonnet, the Peugeot 508 benefits from engines offering a power output from 82 to 150 kW (112 to 204 bhp). Each one is positioned particularly well in its category, both in respect of fuel consumption and CO2 emissions, but also in terms of performance and responsiveness. This range, which begins with CO2 emissions of 109 g/km with the new e-HDi system, will eventually include HYbrid4 technology with its potential of 147 kW (200 bhp) and 4 wheel drive, starting from just 99 g/km of CO2. The top-of-the-range engine at the time of launch is the new 2.2 litre HDi FAP 150 kW (204 bhp) offering a level of performance worthy of a diesel V6 but with a carbon footprint reduced by more than 30%! Emotion, with the Peugeot 508, also finds expression through driving enjoyment, a characteristic highly prized by the Marque. The 508 will be available with two types of suspension: a new McPherson type front axle for the majority of the range, ensuring a top quality blend of comfort and road holding, and a drop link dual wishbone front axle on the "GT" version for enhanced dynamic road holding to match the performance of the 2.2 litre HDi FAP 204 bhp engine. Derived from Peugeot's extensive experience in the field of "exclusive" touring cars (referred to internally as the M2 segment), the Marque, as with each previous generation, has recognised the expectations of customers in this segment. In Europe, two thirds of this customer type is made up of corporate fleet vehicles, often as company cars. Customers who are active, committed, experienced and in search of modernity and status, albeit free of ostentation, who hold fast to certain values and are aware of their responsibilities. Such buyers are drawn increasingly to spacious, timeless and efficient cars: efficient in terms of liveliness, but also and not least in terms of greater efficiency. Naturally they require a car that will see them easily and comfortably through long journeys, at the same time guaranteeing durability. dimensions, particularly width and height, permitting optimised aerodynamics. Optimised aerodynamics and weight reduction were key priorities from the very start of the project, in order to ensure the best possible environmental performance. The Peugeot 508 offers excellent Cx and SCx values for its segment: the best versions have an SCx of 0.58 (Cx of 0.25) for the Saloon and 0.61 (Cx of 0.26) for the SW, i.e. among the best in the segment for each body shape. Similarly, a desire to "optimise weight" eventually gave rise to an "upward spiral" benefitting not only the car's fuel consumption but also its passive safety and dynamic performance. Overall, based on like-for-like engines, CO2 emissions for the Peugeot 508 are 35 kg less than the 407 for the Saloon, and 45 kg less for the Peugeot 508 SW, a performance which takes into account its size (larger by 10.1 cm for the saloon and 4.8 cm for the SW). completion of a two million kilometre road test under real-life conditions prior to launch. Finally, the Peugeot 508 will break new ground in terms of build quality, following on from the most recent product launches where this aspect has been demonstrated and acknowledged. One of the direct consequences targeted by this approach is a reduction in the "total cost of ownership", a decisive factor when buying a vehicle in this segment, particularly for corporate fleets. The design of the Peugeot 508 is guided by the continuous search for perfectly balanced and elegant contours. The contours of the Saloon and SW are free-flowing, without break, interruption or embellishment, from the end of the bonnet to the boot.No ostentatious elements or add-ons are permitted (no windscreen wiper jets, no visible aerials, etc. ): all surfaces are flush-fitting, with clearances between each element precisely determined to obtain optimal build quality. The overall effect suggests a vehicle "sculpted from a solid", refining the sense of elegance, fluidity and build quality. At the front, the Peugeot 508 shows the development of the Marque's underlying stylistic codes, reinterpreted to reflect ideas brought to fruition on the most recent concept cars (particularly the SR1). This visual identity, strong and always recognisable, is even more suggestive of power, refinement and technological modernity. At the end of the long aluminium bonnet, the new Lion identity takes its place naturally at the lead of the bonnet contour. Underneath it, the characteristic single grille takes on a new dimension. It sets the tone for a front grille rendered in a "floating" style, seemingly detached from the body. This effect is created by the chrome edging, which becomes less pronounced under the "nose" of the bonnet to proudly reveal the branding of "Peugeot". The piercing expression of the headlamps was also a focal point of stylists. Their interior design is a blend of chromium plated and frosted surfaces. On versions with directional bi-Xenon headlamps, "LED lighting tubes" are visible, each with seven electroluminescent diodes. This gives the car an immediate visual signature, visible from afar on the road both by day and by night.Halogen headlamps are also available as, they adopt a new high-performance and compact "Neo" technology, with a series of lenses bearing a resemblance to cat's eyes. The sides of the car are purposely understated, enhanced by the contours of the chrome-edged windows (availability according to trim versions). Visually, the side windows appear to rest on a sculpted body section, itself no mean feat of industrial engineering: a recessed waistline runs the entire length of the vehicle, giving it an unusual blend of power and elegance. The Peugeot 508 SW also has a simple and dynamic profile, from some angles reminiscent of a "shooting break", dropping to a rear aspect that is firmly planted on the road. Bringing the gigantic panoramic glass roof (1.62 m2) into continuity with the front windscreen, the profiled aluminium roof bars seem to merge with the body, enhancing the car's exclusivity. On the Saloon, the entire rear section is designed in one form, the boot perfectly flush with the bumper and the two lateral exhaust nozzles on the "GT" version, creating an impression of fluidity, power and control. A horizontal chrome bead on the boot enhances the rear aspect, parallel to the chrome edging at the base of the diffuser which visually "seats" the rear of the car. A visual characteristic of Peugeot's heritage is also particularly marked at the rear of both body shapes. On the Saloon, three red clusters mask three rows of 6 LEDs to give the car a unique night-time signature. The SW for its part has a more composite feel with a red band that lights up when the rear lights are activated. The fascia follows to a large extent the stylistic elements of the car's exterior design: quality, purity and elegance. The design minimises clearances between the constituent parts of the fascia, helped in particular by a multiplexed centre console featuring technology that overcomes the traditional constraints of "ISO" sized equipment. The materials, meticulous finish and studied durability appeal to all of the senses of the car's occupants: the texture of the top of the fascia, the different decorations, the black lacquered centre console, touches of chrome… the overall effect is one of refinement and advanced technology free of ostentation. This extremely rewarding in-car ambience blends refinement and technology with high-tech equipment that enhances the enjoyment of both driver and passengers. A colour Head-up Display (with satellite navigation screen), four-zone air conditioning, "main beam assistance", "hands-free" access and start-up, automatic electric parking brake, driver's electricallyoperated lumbar massage, new telematics, JBL hi-fi equipment. Either available as standard or optional equipment according to models, these systems accentuate the exclusivity of the Peugeot 508. On the Peugeot 508 SW, in-car enjoyment is enhanced by the large panoramic glass roof allowing passengers to benefit fully from exterior light and visibility. This ambience is also the result of much work carried out on acoustics and vibration damping. For example, by tracking down noise to its source (acoustic "encapsulation" of power trains), the level of quietness in the passenger compartment is among the best in any category, while this approach also contributed to the vehicle's weight reduction. Acoustic front windscreen as standard (to filter noise from outside), hydro-elastic suspension mounts (to reduce noise and vibration coming from the road), active damper on the front axle of the 2.2 litre HDi FAP 147 KW version (to reduce engine vibration); all of these elements contribute to the hushed comfort of a passenger compartment worthy of a higher segment. In terms of practicality, the choice of a particularly efficient architecture allows for a very generous capacity and boot. Each passenger enjoys a privileged status, with generous space coupled with dedicated equipment (four-zone air conditioning includes the rear passengers, adjustable seat cushion for the driver and front passenger). Interior dimensions are on a par with those of the 607, i.e. much improved in relation to the 407 (5.3 cm more space between the knees of the rear passenger and the front seat). As a result, two people well over 6 feet tall can be comfortably seated one behind the other. The boot on the Saloon opens by means of a self-actuating lever (by pressing the "plip", a button on the fascia or the "0" of the external badge of the 508), while the tailgate of the SW can be motorised. The luggage compartment is practical (solid hooks, luggage net, housing for warning triangle), accommodating (with its strictly parallel-piped shape) and above all extremely spacious. 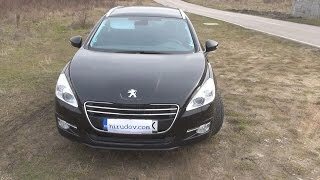 The boot of the Peugeot 508 has a capacity of 545 litres of liquid (515 dm3 according to the VDA standard) for the saloon and 660 litres of liquid (560 dm3 VDA) for the SW, i.e. respectively 108 and 112 dm3 VDA more than the 407 Saloon and SW. With the seat backs folded, divisible 2/3-1/3 in one easy movement (with dedicated controls in the boot of the Peugeot 508 SW), the space created by this flat floor rises to 1,581 litres (1,381 dm3 VDA) for the Saloon and 1,865 litres (1,598 dm3 VDA) for the SW. These volumes include storage under the boot carpet, a space which receives the same quality finish as the rest of the boot, equivalent to 48 litres of liquid (42 dm3 VDA). In addition the rigid carpet of the SW can be folded to divide the boot into compartments, allowing easier access to these storage areas. Similarly, the solid and practical self-winding load space cover is easy to activate. Weight, aerodynamics and of course the Group's technological expertise and innovation in terms of both HDi FAP diesel and VTi and THP petrol engines, are factors which immediately place the Peugeot 508 among the leaders in its segment in every power category. 2.2 litre HDi FAP 150 kW (204 bhp), 450 Nm, 6-speed automatic gearbox; CO2: 150 g/km. 1.6 litre THP 115 kW (156 bhp), 240 Nm, 6-speed automatic gearbox; CO2: 164 g/km. The Peugeot 508 ushers in the era of e-HDi technology for the Marque, a new-generation STOP & START. Rapid, efficient and silent, e-HDi combines reduced fuel consumption and CO2 emissions (up to - 15% in town) with maximum driveability, an innovation for this type of system. It is mated with the 1.6 litre HDi FAP engine coupled with the electronically-controlled 6-speed manual gearbox (BMP6) so that a maximum number of customers can benefit from the lowest possible fuel consumption. Available at the time of launch with a combined fuel consumption of 4.4 litres/100 km for emissions of only 114 g/km, this 1.6 litre e-HDi FAP 508 will fall to below 110 g/km in the course of 2011, with a fuel consumption of 4.2 litres/100 km, due to the introduction of electronically-controlled air intakes. A new 2.2 litre HDi FAP 150 kW (204 bhp) engine, with a maximum torque of 450 Nm at 2,000 rpm, tops the Peugeot 508 range in a "GT" version featuring a special suspension and finish. Thanks to its technological sophistication (lightweight titanium turbocharger impeller, optimisation of friction, VoltControl, piezo-electric injectors with 8 apertures, optimised combustion chambers…) but also due to development of the 6-speed automatic gearbox (a new AM6), this power train develops a level of performance superior to the former 2.7 litre HDi V6 of the 407, with improved liveliness and greatly reduced fuel consumption and CO2 emissions: down 33% to 150 g/km, compared to 223 g/km on a 407 V6 HDi, in other words a reduction of 73 g/km! 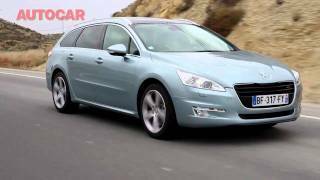 From 2012, the year following the commercial launch of the Peugeot 508, HYbrid4 technology will be introduced to the range. With a HDi diesel engine at the front and an electric motor at the rear, this technology offers potential power of 147 kW (200 bhp) and "by wire" 4-wheel drive and is a solution that breaks new ground in terms of fuel consumption and CO2 emissions. With emissions of 99 g/km as the target, the Peugeot 508 will more than ever combine driving pleasure and environmental responsibility. In this segment in particular, Peugeot has always set the standard in terms of road holding and, as a direct consequence, driving pleasure. With the Peugeot 508, the Marque has taken great strides in accommodating these characteristics in a range able to accept two types of suspension. An all-new McPherson type front axle has been developed on platform 3 for use on the majority of the Peugeot 508 range. Here the 508 offers a new, high-level synthesis of road holding and ride comfort. In terms of comfort, the level of expectations of customers in the "M2" segment has risen considerably in recent years. This engineering choice is another example of the upward spiral set in motion by efforts to reduce weight: the new front axle allows a weight saving of 12 kg compared to the 407. The Peugeot 508 "GT" for its part features a drop link dual wishbone front axle. The dual wishbone and decoupling of bounce and steering functions allow for a very high level of body rigidity and driving accuracy. This choice is consistent with the potential performance of the new 2.2 litre HDi FAP 150 kW (204 bhp) engine, and with the expectations of customers who are particularly demanding with regard to the dynamic capabilities of their car. At the rear, the entire range is equipped with a multi-arm rear suspension. This is designed to ensure excellent efficiency and maximum accuracy and vibration damping by decoupling longitudinal and transverse forces. The rack and pinion electro-hydraulic steering continuously adjusts the effort required, and facilitates manoeuvres at low speed. It fully reflects the Marque's expertise; precise and informative, and corresponds to two driving styles: "all encompassing" or "GT", according to the expectations of their respective customers. Braking is designed to match the dynamic qualities of each Peugeot 508, with front brake calipers in three different sizes: 283 x 26 mm, 304 x 28 mm or 340 x 30 mm for the 2.2 litre HDi FAP 150 kW version. At the rear, the entire range has 290 x 12 mm discs. All 508s come with latest-generation ESP which includes CDS (stability control), AFU (emergency brake assist) and REF (electronic brake force distribution). The ESP also includes Hill Assist and intelligent traction control, which improves the vehicle's ability to move off and be driven on slippery road surfaces by authorising more or less wheel slip on each of the front wheels. The Peugeot 508 benefits from a high level of primary safety, due to its road holding and equipment specification (Head-up Display, directional bi-Xenon headlamps, fog lamps with static intersection lighting, main beam assistance, etc.). The car is also designed to offer a level of secondary safety among the best in the segment. Its collapsible structure includes high-performance shock absorbers on the front beam, which also allows a reduction in the length of the overhang. Once again, safety benefits significantly from reductions in the vehicle's overall weight. The Peugeot 508 is equipped with efficient means of restraint: 2 front air bags, 2 side front air bags, 2 curtain air bags, 2 Isofix fixtures with 3-point attachments at the rear. The front seats have new "curved" head restraints with integral multi-position adjustment whose shape has been carefully studied to take into account the effects of rear collision (whiplash). The Peugeot 508 also makes the most of the Marque's leadership in terms of tertiary safety by offering, as on most vehicles in the range, the Peugeot Connect system (market dependant). This system lets you benefit free of charge and for an unlimited period from the Peugeot Connect SOS service, as well as from Peugeot Connect Assistance. For professional customers, via subscription, the Peugeot Connect Fleet service (automatic uploading of information relating to vehicle maintenance) completes this range of connected services. It's worth noting that Peugeot Connect SOS, present to date in 10 European countries and on more than 400,000 Peugeots, pinpoints the location of the vehicle and enables the dispatch of appropriate emergency services in the event of an accident. Since its launch in 2003, it has facilitated rapid intervention by the emergency services in nearly 4,000 emergency situations.